We'll be getting started with the Great Owl Crochet-Along in a couple days here, so I thought I'd talk a little bit about the pattern and how I get started on an amigurumi project. If you've already peeked at the pattern, you know that I don't use the fabled "magic ring" technique to begin my rounds. Some of you may be wondering "why" -- and perhaps more importantly -- "what's the difference?" A lot of amigurumi patterns out there simply tell you to start by single crocheting 2-8 stitches into a magic ring. No explanation as to what a magic ring is, how to do it, or even where to learn more about it. When I first started making amigurumi, I can't even begin to tell you how frustrating this was to me. And then I found Tiny Yarn Animals by Tamie Snow and realized that a good pattern doesn't have to start out with a confusing technique. Now for the nitty gritty -- what's the difference? 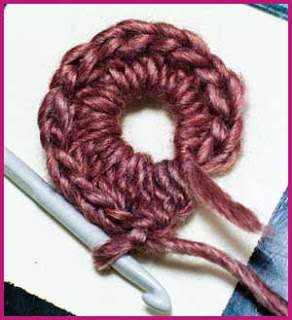 There are some trade-offs between the way I start my amigurumi and using the magic ring. As I've already mentioned, "CH 2 and SC 6 times in second CH from hook" just comes out a lot clearer for someone who hasn't had a lot of experience in amigurumi. That, and I have always figured that if a person did know how to use a magic ring and preferred that technique, they would know enough about how to substitute it in the pattern. See all the space she has in the middle? She can easily add lots of stitches to the first round without straining her fingers or her eyes. But, once she's finished adding her stitches for the first round, she just pulls the free tail and cinches everything up nicely. You can check out the whole tutorial on CrochetMe if you want to see how it works out. With the chain technique I prefer to use in my patterns, you're instead putting all of your first round stitches into a chain stitch. If you've got a lot of stitches to add, that can get pretty crowed. Luckily, most amigurumi patterns only start with 4-8 stitches in round 1, so I think the crowd is manageable. In the end, how you start your owl is up to you. You can go with the chain technique in the pattern or the magic ring. 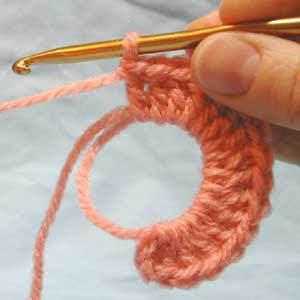 If you would like to try the magic ring, I found a fantastic video tutorial on HookAnd Needles.com. And, I think everyone would love to hear comments from "magic ringers" as to how this technique improves the amigurumi-making process -- so be sure to add your thoughts to the comments! I've used both. I like the magic ring technique but don't really think about using it unless a pattern says. When I create my own toys I use the chain technique. I'm usually happy with the effect either way.